stock here....they are immediately pimping out that "Officials in the cities of Aztec and Farmington say they have shut down the river’s access to water treatment plants, adding that the communities had a 90-day supply of water." ALBUQUERQUE, N.M. – Anger was mounting Monday at the federal Environmental Protection Agency over the massive spill of millions of gallons of toxic sludge from a Colorado gold mine that has already fouled three major waterways and may be three times bigger than originally reported. An 80-mile length of mustard-colored water -- laden with arsenic, lead, copper, aluminum and cadmium -- is working its way south toward New Mexico and Utah, following Wednesday's accidental release from the Gold King Mine, near Durango, when an EPA cleanup crew destabilized a dam of loose rock lodged in the mine. The crew was supposed to pump out and decontaminate the sludge, but instead released it into tiny Cement Creek. From there, it flowed into the Animas River and made its way into larger tributaries, including the San Juan and Colorado rivers. Really now? 90 days? In a desert? Does anyone think their community has more than a 3 day supply even under rationing conditions? Thanks EPA, glad you are setting acceptable human levels for radiation for NRC promotion. Is this somewhat akin to the Mount Polley Mine Tailings Pond disaster, where Uranium and deadly decay daughters rarely or never are directly mentioned publicly via MSM? Quote of stock: "I have been posting for around 4 years about my data mining of EPA data which shows probably 200,000 lbs of uranium blasted into the air and detected by EPA air sampling machines. A massive "duh" moment. I thought they were distracting us from strontium by focusing on Cesium. DUH! They were distracting us from uranium and plutonium!" I guess California, Nevada & New Mexico, including the Navajo Nation (et al) are left to drink "Alphabet soup". It's OK though, says EPA. It's already "diluting". Like brand new, even. Befuddling dumbfockers need be befunded. Quote: "The Navajo Nation and Colorado Governor John Hickenlooper declared a state of emergency on Monday, August 10, after EPA (Environmental Protection Agency) officially confirmed that 11 356 235 liters (3 million gallons) of toxic mining sludge from a mine in southwest Colorado leaked into the Animas River. The contaminated wastewater flowed down the San Juan River toward Lake Powell in Utah, responsible for supplying the southwest with drinking water." Yesterday they said it was safe to drink. If it is, I appreciate if they would take the first drink. If they stay healthy then others will drink it. The officials who caused this should be the firs to drink a glass of this contaminated water." Quote: " The EPA actually has no concern for the environment, they just happen to use the environment as a cover story to create laws and gain an advantage for the companies that lobbied for exemptions to the agency’s regulations, and to collect money in fines. There are solutions outside the common government paradigm, and that is mainly the ability for individuals, not governments, to hold polluters personally and financially accountable." Thanks to Silver for the link. Title: "EPA plan is really a 'Superfund Blitzkreig'"
Thanks to ZerOhead for the link. Thank you Dave Taylor for putting pen to paper there!!! Quotes from link above: "Yes this letter was published in the July 30, 2015 edition of the Silverton Standard. -Mark Esper, editor and publisher." I came to Silverton this summer to enjoy my retirement, appreciate nature and prospect the mountains for unique minerals. I came here to enjoy a simple life with no TV and no politics, but unfortunately that has changed. Your EPA dilemma has caused my blood to boil. Based on my 47 years of experience as a professional geologist, it appears to me that the EPA is setting your town and the area up for a possible Superfund blitzkrieg. In regards to your meeting with the EPA on June 23, Mr. Hestmark's (EPA representative) statement "we don't have an agenda" is either ignorant naivety or an outright falsehood. I am certain Mr. Hestmark's hydrologists have advised him what's going to happen when the Red & Bonita portals and plugged and the "grand experiment" begins with unknown and foreseeable results and possible negative consequences. Following the plugging, the exfiltrating water will be retained behind the bulkheads, accumulating at a rate of approximately 500 gallons per minute. As the water backs up, it will begin filling all connected mine workings and bedrock voids and fractures. As the water level inside the workings continues to rise, it will accumulate head pressure at a rate of 1 PSI per each 2.31 feet of vertical rise. As the water continues to migrate through and fill interconnected workings, the pressure will increase. Eventually, without a doubt, The water will find a way out and will exfiltrate uncontrollably through connected abandoned shafts, drifts, raises, fractures and possibly from talus on the hillsides. Initially it will appear that the miracle fix is working. But make no mistake, with in seven to 120 days all of the 500 gpm flow will return to Cement Creek. Contamination may actually increase due to disturbance and flushing action within the workings. The "grand experiment" in my opinion will fail. And guess what Mr. Hestmark will say then? Reading between the lines, I believe that has been the EPA's plan all along. The proposed Red & Bonita plugging plan has been their way of getting a foot in the door to justify their hidden agenda for construction of a treatment plant. After all, with a budget of $8.2 billion and 17,000 employees, the EPA needs new, big projects to feed the best and justify their existence. I would recommend that anyone who owns a home, property water well or spring in the Cement Creek drainage take water samples ASAP to protect themselves from groundwater changes that may be caused by the EPA plugging operation! God bless America! God bless Silverton, Colorado. And God protect us from the EPA. 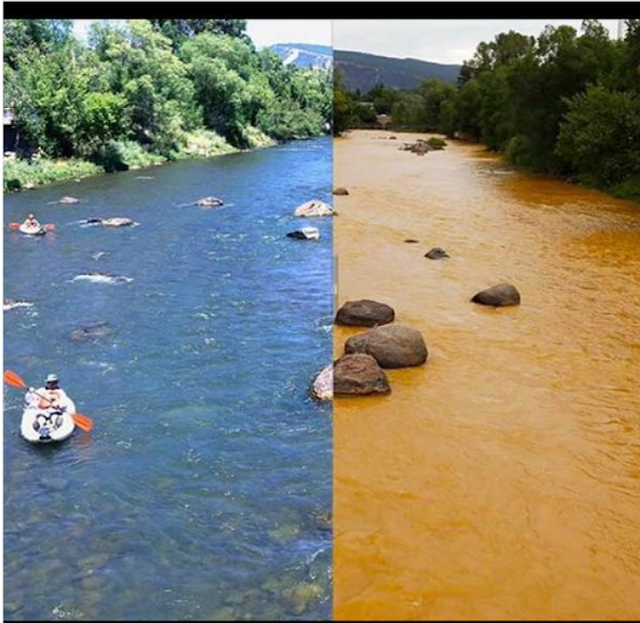 Dud here: I wonder how many of the thousands of abandoned mines the EPA plans to "clean". It is because of the bad attitude of the federal government bureaucrats, and especially those at EPA, that throughout his career, Taylor avoided undertaking projects for them. “Whenever I worked for them, I always dreaded it because they have such a know-it-all attitude. That’s how they got in trouble on this deal. They just didn’t think,” Taylor says."